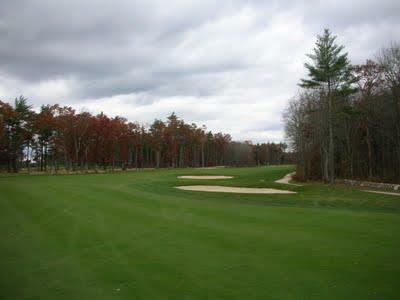 The Bay Club offers a country club setting within a community of custom homes and conservation land. The property encompasses 625 acres with an additional 300 acres of conservation land. Of the 65 acres, the country club occupies 155 acres and 270 acres are reserved for residential development in six villages with 175 home sites. Approximately 200 acres are permanently committed to open space. Utilities for all home sites are underground and include Town water and sewer, electricity and natural gas, plus fiber-optic cable for telephone, cable TV and high-speed Internet service. Unique among golf course communitites, the Bay Club is member owned. The Club includes a championship 18-hole course and extensive practice facilities designed by PGA professional Brad Faxon in conjunction with golf course architect Brad Booth. Other facilities include fine dining and light fare at the Golf House as well as the Sports and Activities Center, which is a 10,000 square foot fitness facility, with professional fitness staff. Racquet sports include tennis on four Har-Tru hydro courts and two paddle courts. The Aquatics complex is highlighted by a Junior Olympic sized pool with lap lanes and zero entry access. Homes in the Bay Club reflect the casual grace of a seaside village, traditional style, yet modern in function and amenities. If you are interested in buying an existing home at the Bay Club or purchasing land and building your dream home contact one of our agents listed on this page for a free consultation and learn what we can do for you as your Buyers Agent. We can also help you with a Club Membership even if you are not interested in purchasing a home yet. Besides golf memberships there as also Family Social Memberships with the family membership you can enjoy all the amenities excluding the golf course. Are you are considering selling your home and enjoying the good life at the Bay Club? Fill out the Home Evaluation Form below and we will let you know your properties Market Value and offer you a FREE NO OBLIGATION CONSULTATION with a Real Estate Professional to discuss your Real Estate needs. Please complete and submit the following Online Property Evaluation form. The more information given, the more accurate the evaluation. All information you provide is secure and will be kept strictly confidential. Contact any one of our agents to assist you in the purchase of real estate or a Family Golf or Social Menbership.